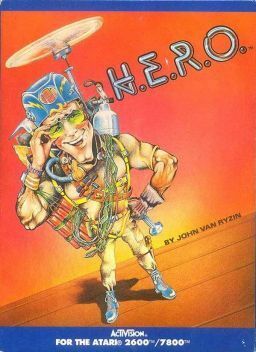 The title of this superb game H.E.R.O. is actually an acronym standing for Helicopter Emergency Rescue Operation. 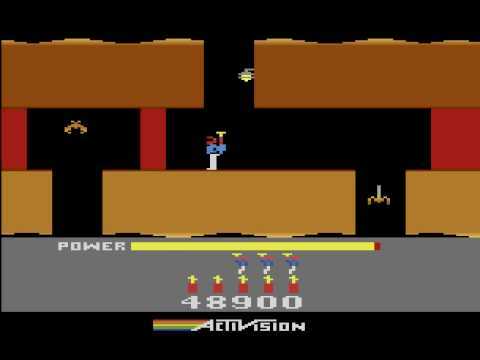 Written by John Van Ryzin and published by Activision this epic, single-player video game was first released on the Atari 2600 in March 1984. Funnily enough your role in the game is as a hero called Roderick Hero (sometimes styled as “R. Hero”, a play on “our hero”). He is a one-man rescue team and his mission is to rescue miners that are trapped inside Mount Leone. At his disposal he has a few items to help him on his way but his main piece of kit is in the form of a backpack-mounted helicopter unit. With this he can fly and hover enabeling him to travel deep into to bowls of the mines. He only has a limited amount of power in his back pack and is only being able to rescue one miner at a time, so as they say time is of the essence! With each rescue the next miner is trapped further into the mine making his task more and more difficult. To help Roderick in his task he also has a helmet mounted laser and a limited supply of dynamite to help overcome some nasty obstacles along the way. As you travel through the mines some are illuminated by lanterns that are mounted to the walls, if these are accidentally hit by your laser then your task becomes even more difficult, navigating the mine in complete darkness. 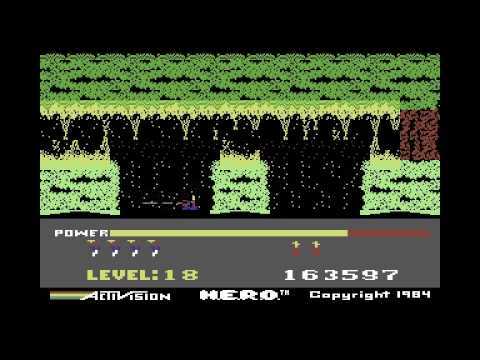 You will come across sections of a cave that has fell-in, these can be blown pretty quickly with the use of dynamite but if you have run out you can still use the laser but this uses valuable time. The mine shafts are also home to bats, spiders and other strange unknown creatures that will kill you upon a single touch, but with use of the laser they can be overcome. As you progress through the levels they become more difficult with walls and floors of magma, the walls again can be blown using dynamite. You will have to have a steady hand to hover over these magma flowing floors otherwise you will be incinerated. In deeper shafts you will encounter flood water which again you will need to hover over carefully to rescue the trapped miners. When you reach a miner, points will awarded for his rescue and along the way other bonuses will be awarded for creatures being killed and walls being blown away. You will also be awarded for any power remaining in you back-pack and sticks of dynamite left. An extra life will be awarded after every 20,000 points scored. With the games success, H.E.R.O. was ported to other systems including the Atari 5200, Colecovision, Apple II, the Atari 8-bit family, Commodore 64, MSX and ZX Spectrum. Sega had even had the software re-written so it could feature on the SG-1000 gaming console in Japan in 1985, while the gameplay was identical, Sega changed the backpack from a helicopter to a jetpack but the rest of the game stayed the same. More recently on the next gen consoles version of H.E.R.O. has been included in compilations such as Activision Anthology. In June 2010, the Atari 2600 version of H.E.R.O. was re-released for Microsoft’s Game Room service for the Xbox 360 and Games for Windows Live. You can either load the game without running. Enter the following commands in basic before restarting the game with the system code – SYS 7488.